Please note that the links provided are for your convenience and other sources are available for these items. Start off with some healthy wax worms. 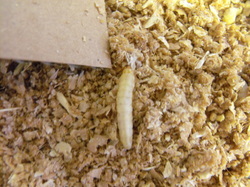 Healthy wax worms are cream colored with no dark discolorations in them at all. You will need determine how many worms you want to breed. Keep in mind that one female moth can lay up to 500 eggs. So you don't need a huge amount of worms to pupate unless you are going big and bold. 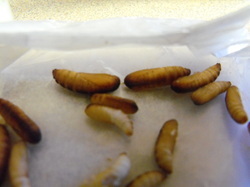 The worms shown here have been kept on a substrate of bran, honey and glycerin. Making substrate was covered in the video but here is a brief description. Some use bee pollen and honeycomb pieces that have been grated in their substrate. We have experience doing it both ways and did not see a noticeable difference in either. 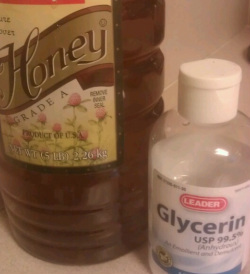 The biggest factor is getting the right moisture level and amount of glycerin. You do not want your substrate drying out in the process. 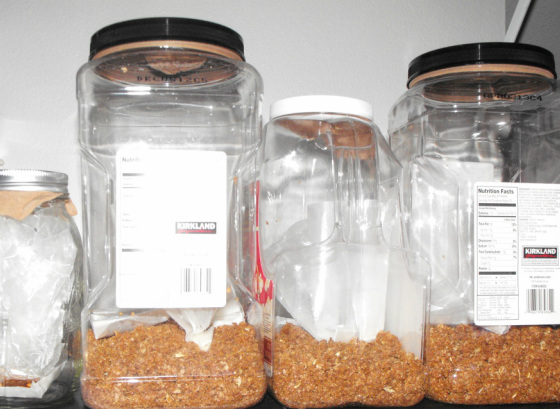 If you do find that your substrate is too dry after the moths have died, you may add more substrate to the container. Your larvae will gravitate to the substrate they can burrow in. After a period of time, it can vary with your worms you will find the worms have changed to a burnt looking pupae. These are not dead. Black worms are dead worms and should be discarded properly. Temperature plays a factor in the entire production of wax worms and the warmer the container is kept the faster the entire process goes. These pupae should be placed in a container with substrate. Now here is where the information may vary from place to place. The lid of your container. The lid of your container should have some holes drilled for ventilation if you are going to use nylon stockings as a barrier. It should be noted that they can and will find a way to escape from their container at some point if you do not use a very fine mesh screened lid. This can be accomplished by using some very, very fine mesh screen (normal aluminum screen for windows is too big. You can create the screened top by using fine mesh and a hot glue gun to glue the screen in. Be sure to completely seal the mesh as they will find the escape route, if there are any. The picture below shows nylon covered lids, which is fine up until the point that the very small larvae hatch. After a successful pupation the moths will emerge from the pupae and live 7-10 days. They do not need to eat or drink during this time, their sole purpose is to mate and lay eggs. It should be noted that you should very carefully open the container once they have all died. You can remove each moth after they have completed their life cycle and have died. It is suggested you do this in a small enclosed room that you can quickly get any escaped moths. It is important to not release any of these into the wild as they naturally go to a bee hive and can decimate a hive. Each female moth can lay up to 500 eggs. So if you put 20 pupae in a container, you may have 10 (or so) female moths. Which could produce 5000 larvae. You can see that can quickly result in a LOT of worms. Most small hobbyists do not have enough animals to eat that many wax worms and you may find yourself giving worms away to other herpers. With some time and patience you will see tiny worms moving in the substrate. They start off as tiny white lines, no thicker than a hair and you will see them climbing all over the container on the inside. This is where panic can set it when you see them coming through the nylon barrier you thought would contain them. If you use an extremely fine mesh you may or may not see them. If you see escapees you can put the container in a moat of water. In short time they will not be able to escape the netting or want to travel far from their food source and will keep burrow or climbing on the substrate. If you see that they are moving to escape they may be lacking in food sources, and adding substrate with honey and glycerin (and the optional bee pollen) should keep them happy for a good amount of time. You should be checking for mold often. Mold will kill them or have them on escape mode. 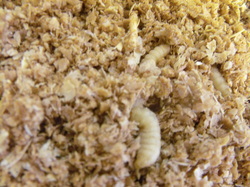 You will find the freshly hatched worms move a LOT faster than the wax worms you buy from the store. They create a lot more silk like substance and in comparison to store bought are like the ninjas of the wax worm world. These more active worms are a delight for reptiles to eat. Wax worms are known to be the crack for reptiles. They should be used as a treat and not as a primary staple. Nutritional information on wax worms is here.